Welcome to Esteem, a review site created by Evan (aloveletter) since April 19th, 2011 and recently reopened on July 13th, 2012. Esteem's main goal is to contribute to improving the quality of the site community of Neopia. It aims to help Neopia's sites by providing the owners with thorough analyses and constructive criticism. Please note that Esteem will be only be open until the end of August. If you have any questions or comments that pertain to Esteem, please let me know by sending me a neomail. - Completed HTWGR's review! You can read it here. HTWGR has also been deemed Esteemed! - Lost one affiliate, Potential. - Finished part 2 of HTWGR's review! You can read it here. - Completed three chapters of HTWGR's review! 4 chapters to go. - Now affiliated with Shenyi and The Silver Book! - Received some great tips for TRH from Star - thank you! I am currently in the process of writing The Reviewee Handbook, a mini-guide of what requesters should do before, during, and after reviews. Only active sites in Neopia without any stolen or uncredited content may be reviewed. In order to be reviewed, a site must not have any under construction content pages. Exceptions include any Extras pages. Because of my limited knowledge and experience, no applications, guilds, shops, about me pages or galleries will be reviewed. Previously reviewed sites may only be re-reviewed if major changes have been made. Please link back to Esteem after your review using an available link back button. Use and completely fill out the form below. I will reply as soon as I receive your request. If you do not see your name on the waiting list after 3 days, neomail me with a completed form again. Please only send in request forms when requests are open! I highly suggest that requesters read my credentials before submitting a form. Introduction and/or Updates /10 - Introductions should be eloquently written and contain the name of the site, the name and username of the host, a link to the host's userlookup and a brief description on content offered. Updates, if any, should be easy to follow and concise. Organization and Convenience /30 - Vistors must be able to travel from page to page without difficulty. Back buttons and to the top buttons should be included when necessary and all areas for requests should have neomail or userlookup links. Everything should have logical placement and tables should be used when appropriate. Space should be conserved to allow for less scrolling time. Layout /10 - The layout of each site will be assessed based on appeal, convenience, size, and other determining aspects. Spelling and Grammar /15 - A certain amount of points will be deducted per spelling/grammatical error, depending on the amount of text present on the site. Link Back Buttons /10 - The amount of link back buttons should correspond with the site's age. The buttons should be high quality, with easy to read text, non-pixelated images, and visual appeal. Each should link back to the appropriate creator and text boxes should be provided. Other Sitely Aspects /5 - Sites should be listed at most of the major and active directories. The amount of affiliates should correspond with the site's age. As well, the method for applying to be affiliates with the site should be clear to other site owners. Readability /5 - All text and headers should be legible in terms of size and colour and visitors should not have to strain their eyes to read any portion of the site. Link Sweep /5 - A certain amount of points will be deducted per inactive/broken link, depending on the amount of links present on the site. Quality of Content or Service /10 - A general assessment of the quality of the reviewed site's content or service will be made here. Content and service will be assessed based on their usefulness to the community and other aspects that may differ depending on what is offered. The pros/cons review can be applied to any site. It is a quick summary of five positive and five or more negative aspects of a site, with provided critique and suggestions for each of the points. It is recommended for those who want a speedy appraisal with a few detailed suggestions. An estimated mark out of 100 will be provided at the end of the review. The reviewed site will also be deemed either recommended or not recommended. The sweeper review is a very thorough sweep of all dead links as well as a in depth spelling and grammar check of a site. Sites who have previously been reviewed can continue to request this review type at any time. No score will be provided but a site may be deemed recommended or not recommended after this review. Click the grey next and back buttons below to scroll through recent reviews. Only 3 reviews will be displayed on Esteem at a time. If you would like to see your review once more, do not hesitate to neomail me and ask! - Most of the listed points are phrases copied directly from your text with various edits. The portions that have not been changed will be in normal font. - Indicates the location in the guide of the critique. - Added or edited portions of text. - ** Comments about content (not copied directly from your text). **Note: I have not edited the phrases and comments made by other site owners. #1. Using Headers And Text Styles. When you are formatting reviews that focus on specific categories (such as the "classic") rubric, use headers to help segment your review into smaller pieces so that each section becomes more self-contained. #2. Using Headers And Text Styles. Make sure that your headers aren't too large because then they will just add to the amount of scrolling and would look a bit awkward. #3. Using Headers And Text Styles. ** Where you mention the underline text style and provide some coding, I recommend that you show an example of the text style in order to show your readers what the code will produce. Perhaps use it in this section: For example, I use underline to really emphasize something important. #4. Tiny Box Is Tiny. ** The title of this section does not seem appropriate for all of the content written. You have only mentioned the point about having a tiny div box once, and the rest of the content discusses other text formatting tips. Consider revising it to suit the rest of the content. #5. Tiny Box Is Tiny. Though it's popular to use smaller sizes (such as the one used for the navigation), keep in mind that some of your reviews and rubrics will be much longer. #6. Tiny Box Is Tiny. Never center the text for your reviews or rubrics. #8. General Formatting Tips. The major problem that most review sites have is that they clump their (delete the word entire) reviews into giant walls of text. Sometimes they use line breaks to create (delete the word a) "new" paragraphs. #9. General Formatting Tips. ** I recommend that in the first div box in this section, you put the "dos" and "don'ts" for each type of review next to each other. Currently, it is difficult to compare the two when they are not side by side. As well, perhaps putting the two different types of reviews into separate div boxes would work to better separate them. #10. General Formatting Tips. ** Some of your general formatting tips are redundant because they were already mentioned in previous points. For example, the first and second points repeat the point of using bullet points for the pro/con review. This makes both these points not seem defined.Try not repeating yourself too much to make each of the points have its own purpose. #11. General Formatting Tips. For your large screenshot/image example, I also recommend that you include a visual example above or below the coding to show the reader what your coding will produce. #12. General Formatting Tips. This will just make it much harder for the reader to follow and edit his or her site. Space each error into a separate paragraph. #2. The Site I'm Reviewing Is Perfect. Additionally, rather than keeping each category blank or simply writingNo issues were found", you should focus on what positive features stood out. #3. The Site I'm Reviewing Is Perfect. Remember: positive feedback lets the site owner what he or she is doing right! #4. I Want To Add Something "Fresh" To My Site. Having different rubrics is not only great for visitors, but as a reviewer, you won't be stuck writing the same "classic" or pro/con" review every single time. #1. How To Deal With Reviewing Other Review Sites. Just because the type of content (delete the word they) offered is words doesn't mean you'll be doing anything different. Look at the quality of his or her reviews (such as his or her explanations) and the quality of the rubrics. Don't focus on whether or not you agree with his or her opinion - that's not your job. Instead, focus on how he or she is writing his or her reviews. #2. How To Deal With Criticism When you are dealing with negative criticism, take the reviewer's explanation into account. Has he or she fully explained his or her opinions? #3. How To Deal With A Complaint. Even if you give them a 100/100, A+, and a gold star afterwards, it's not going to help improve his or her site. #5. How To Deal With A Complaint. If the person disagrees with your comments (for example, if you said something like Your buttons need a lot of improvement because of so and so…), calmly tell him or her that it was only your opinion and that it's not "fact". #6. How To Deal With Theft. If you strongly think that another reviewer has been copying your work, the simplest thing to do is to approach the person and ask (delete the word them) directly. This doesn't mean going out accusing someone straight off the bat, but just send him or her a polite neomail and ask (delete the word them) if perhaps he or she has read your review before writing his or her own (this is usually how reviews get copied - if ideas "stick" in the minds of a reviewer and he or she remembers yours while writing). #8. How To Deal With Getting A Low Score. You asked the reviewer for a review and he or she has done his or her job. Whether or not he or she has provided a high-quality review is beside the point (even if you complain, changes are it's not going to make him or her become a better reviewer). #9. How To Deal With Getting A Low Score. If someone is more focussed on getting a high review score, then his or her heart is in the wrong place and he or she is not serious about improving his or her site anyways. #10. How To Deal With People Who Don't Change Their Sites. One of the things that will irk many reviewers are people who read their reviews and don't bother changing a single thing on their site. Unfortunately, this is to be expected as sometimes owners care more about the score and winning an "award" than actually putting effort into their sites. #1. Opening Part. When I review other review sites, one issue that pops up time again (especially with new reviewers) is the fact that the site owner ignores his or her own suggestions. The very problems that are pointed out in his or her reviews can be found at his or her own review site! #2. Practice What You Preach. One of the things that makes a person an adept reviewer is if he or she can understand what makes something an issue at a site. #3. Practice What You Preach. ** I recommend that you remove the second sentence in the first paragraph: In the next section we'll talk about plagiarism so I won't say too much about it here.. It interrupts the flow of the first paragraph and distracts from the main idea. I had to read the paragraph several times in order to fully understand its purpose. Without this sentence, it reads and carries the overall idea much better. #4. Practice What You Preach. While they may read other reviews to get "inspiration", chances are these issues are things they themselves will never catch since they don't understand why they are problems in the first place. #5. Practice What You Preach. However, when I search the reviewer's own site, there are multiple linked borders as well! #6. Checking Your Own Site. It would get a bit irritating if site owners used smilies all over his or her page. #1. Opening Part. While it's very easy to spot if someone is stealing graphics or other visual content (like layouts), spotting similarities in written content (delete can be just as easy but it) often goes by unnoticed and labelled as "coincidence". #3. Staying Away From Other Reviewers. In essence, the plagiarised version is simply a paraphrased version that doesn't take the other reviewer's own views into account. #4. Go Into A Review With Your Own Set Of Questions. However, in the second set of questions, you're clinging onto someone else's opinions and focus - he or she pointed out this issue, so I "have" to say the same thing. #5. Introducing "Referencing": An Anti-Plagiariser. Rather than copying the comments or poorly paraphrasing his or her review as your own, why not reference a particular quote and talk more about it? #6. Introducing "Referencing": An Anti-Plagiariser. He or she has already read the review. Now it's up to you to put your spin on it! #7. To Summarize. Be respectful of your fellow reviewers. They're in the same boat you are and they managed to write reviews without resorting to copying. You should too! #8. To Summarize. Be opinionated. By copying a review, you're relaying someone else's opinion, not your own. A site owner requests a review to improve his or her site by reading your opinion. #1. What To Do When You're Burnt Out. Before you go on hiatus, however, make sure tha you either finish the reviews on your waiting list or contact the site owners to let them know you won't be able to write their reviews. #2. The Alternatives! - Call 'em as you see 'em. Rather than provide organized rubrics that visitors choose from, the reviewer simply writes down a list of (delete the word their) suggestions. (like a "pro/con" rubric, minus the "pro" and "con" headings). This is great because it allows the reviewer more freedom in his or her reviews. He or she can browse through the site as he or she normally would and write down anything that catches his or her eye. #2. Second Paragraph. Having a review site is extremely rewarding to the site owner because you're actively helping someone else to improve his or her site. The Verdict: Turnip, it is clear that you have written a fantastic guide for the reviewing community. It's full of great insights and tips to help any beginner start or even veteran improve his or her reviews. There were a few reoccurring grammatical errors but not much that affected the content. With a few small touch ups, I believe your site will be a guide that Neopians will rely on for years to come. Congratulations! #1. Opening Part. You've received a request (delete sent in) and you're ready to start writing your review. #2. Don't Tread In Shallow Waters. Sure you're pointing out issues but remember to discuss the reasons as well. #3. Don't Tread In Shallow Waters. ** I remember you mentioning that reviewers should also discuss how in their reviews. Perhaps you should add this to your template under Do. #1. Opening Part. ... or that you "didn't like his or her graphics". #2. Opening Part. ...they are actively seeking opinions, suggestions, and comments about their sites. #8. Examples Of How To Use The Key Ingredients - Scenario #1. Also it's very helpful to the site owner if you include important details. In this case, you should include your screen resolution. #9. Examples Of How To Use The Key Ingredients - Scenario #1. This is a problem because it makes your site seem less polished and the side scrolling will be inconvenient for people viewing your site. #11. Examples Of How To Use The Key Ingredients - Scenario #1. Additionally, avoid blowing up the image and making the original picture larger than it was. #12. Examples Of How To Use The Key Ingredients - Scenario #1. Because the problem is essentially "hidden" from the site owner, you need to be able to apply clear reasoning on why he or she should change a part of his or her site that he or she doesn't have an issue with. #13. Examples Of How To Use The Key Ingredients - Scenario #2. The site has been open for about 4 months now, and the site owner has applied for an in-depth review. After going through his or her site, you realize that he or she doesn't have a lot of content (specifically banners). #14. Examples Of How To Use The Key Ingredients - Scenario #3. One of the most common mistakes a reviewer can do is not explain his or her positive statements. Remember that even though you have no problems with something, you should still give your reasons as to why you think so. #15. Examples Of How To Use The Key Ingredients - Scenario #3. By telling a site owner what you thought worked well, he or she can keep on doing the right things. #16. Why? Why? How? The more you explain yourself, the more likely it is people will take your opinions to heart and make changes around their sites. Reviews are meant to be analyses, rather than to-do lists of things to change. #1. Why Should I Include Positive Things In A Review? A site owner requests reviews to know more about what to improve about his or her site but positive review statements will let the requester what he or she is doing right so far, which is just as important. #2. Why Should I Include Positive Things In A Review? A site owner works hard- why not give him or her some words of encouragement? If something catches your eye for positive reasons, take some time out and pat him or her on the back. #3. Is There Such Thing As An Overly Negative Review? A lot of the time, you'll be reviewing new sites and you don't want his or her first foray in the site community to be a depressing one. He or she has asked you for a review, not a list of "you're doing this wrong, your site stinks!" issues. #4. Is There Such Thing As An Overly Negative Review? The key here is encouragement for the future or after he or she has made some changes to the site. You should definitely try to encourage the requester especially if he or she has received a low score. #5. Don't Turn A Blind Eye In Favour Of Praise. What's one of the worst thing you can do as a reviewer? #6. Don't Turn A Blind Eye In Favour Of Praise. I've mentioned this a lot already but reviews are meant to help the site owner so you shouldn't be afraid to voice your opinions, even if they are negative. #7. Don't Turn A Blind Eye In Favour Of Praise. How else is he or she going to improve if you keep quiet?. #1. Tip #1: Put yourself in the mind of the site owner. Yes, you're reviewing his or her site from the eyes of a visitor, but you should also try to look at the page from the site owner's eyes. Why do you think he or she made the particular choices that he or she did? #2. Tip #2: Think you'll be busy soon? There's nothing worse than having disgruntled people waiting weeks for their reviews. #3. Tip #4: Give analogies and examples. References, screenshots of their layouts, links to outside guides and tutorials - these things will help them learn and is part of the "how" statement. Screenshots really help since the requesters may see their pages differently. #4. Tip #5: Your review site offers a service. Your requesters should never have to wait more than seven days for their reviews. Any longer and you're either not reviewing fast enough or (delete the word you) simply allowing too many people on your waiting list. #5. Tip #6: Don't be worried about "hurting the site owner's feelings" in your review. The requester should be fully aware of this when he or she is requesting. #6. Tip #7: Keep old reviews for a few weeks after taking them off your site. Sometimes, a site owner may want to look back at his or her previous review so it would be convenient for him or her if you kept a copy of it on hand. #7. Tip #12: Is the site owner's work well represented? For instance, if you're reviewing a button request site, make sure all of the link back buttons are made by the owner (i.e. he or she hasn't used any that are made by other people). #8. Tip #13: Using premade layouts should never be a problem! However, if he or she is using a template like those from That Kills Me, then focus on how he or she has edited the layout to customize it. Here, points can be deducted if he or she is still using default colours like grey for the background and (delete the word grey) text styles. If he or she hasn't put any effort into making a template his or her own, that's cause for deduction. #9. Tip #14: Your rules should be short and sweet? Requesters shouldn't have to read novels before sending in their forms. #10. Tip #15: Should you have "award" icons/buttons at your site? There's nothing wrong with giving "award" graphics to those who get high marks since high scores mean they've worked hard on their sites! #1. Be The Ultimate Proof Reader. One mistake new reviewers make is posting their reviews straight after they've finished writing them. #2. Be The Ultimate Proof Reader. Be sure to read through your finished review at least once before pressing the Save changes button. #1. The quotations at the beginning of each chapter. I recommend adding a period at the end of the quotation and moving the name of the person who said the quotation outside of the quotation marks. #2. The use of their versus his or her. Contrary to popular belief, the term their cannot be used to describe a singular person with an unknown gender. It is actually used to describe a plural subject. Unfortunately, instead you will have to use the three words his or her to describe said subject. #3. To Summarize. In the title of this section, I recommend you replace the ellipses with a colon. As well, the colour of this text does not stand out very well against the white background of your content box. I recommend making it either larger, darker, or add a text decoration to "extend it" like the other headers in this section to better separate the content from the summary. It was a bit difficult to differentiate between the content sections and the To summarize section. #5. Comma Usage (Or Lack Of). Watch out where you are or aren't using commas! I will place more emphasis on where you lack commas. Try to read your sentences out loud or in your head and notice where you naturally pause. These areas are usually places where you require commas. #6. Chapter Titles. I recommend that in the titles for each chapter, you include something such as Chapter 7, CH 7 or even #7, just to make it easier for your readers to know which sections of the guide they are reading. #1. Let's Look At Your Resume. First, get the site owner's permission and let them know that you'll be reviewing his or her petpage as "practice". #5. Important Traits of a Reviewer. Running a review site can be draining, whether it's from dealing with people who disregard the rules or reviewing sites that you feel just aren't very high-quality. #6. Important Traits of a Reviewer. You should be able to write your reviews as if you are in a debate class, in which you're trying to get your point across to someone who (removed the word will) always disagrees with you. #7. Important Traits of a Reviewer. ** Here's a general comment for the ability to argue your point and persuade the site owner blurb: Instead of using directives in this section, I recommend that you describe the trait and save the suggestions for another chapter. So the phrase Don't try to be an aggressive arguer… would not be fitting in this section of your site that is purely meant for describing characteristics. May I recommend the following: You need to be able to provide constructive criticism as opposed to slamming someone else's site. #8. Important Traits of a Reviewer. ** In the last sentence, I recommend removing the words I think because these two words make you sound unsure of yourself and your guide should be written in a more confident tone. #9. What To Review? Petpages, guilds, pet applications - there's so many things to review! #10. What To Review? ** Instead of using the word limits in the second sentence, I recommend you use the word weaknesses to counter the word strengths used after. #13. To Summarize. …to help other people improve their sites. #14. To Summarize. ** In the second bullet point, another review should be another reviewer. I would also suggest that you move reviewing isn't for everyone to the beginning of this bullet point, as it is the main point of the bullet. #1. Important Sites To Visit. ** After the phrase though often ignored in the past should immediately be the object that it is describing. However, currently it is more and more sites instead of the quality of service of a site. Try rewording it so that the specific object being described immediately precedes the descriptive fragment. #2. A Community Of Reviewers. Within the site community (remove at large) (insert comma here) there's a smaller community of reviewers. #3. A Community Of Reviewers. After writing a review, you may want to ask another reviewer what he or she thought of your finished product. #1. Opening Part. ** For the first sentence, the portion before the comma (As reviewers) does not describe the portion that comes directly after the comma (your site). As well, there are some singular/plural subject agreements with this sentence. Consider revising it to the following: As a reviewer, you own a site that offers content in the form of words, text, and persuasion! #2. Opening Part. No, I'm not talking about the Jane Austen novel, but instead good old fashion opinions. #3. Opening Part. Your reviews offer suggestions and comments to requesters. #4. Terms I Use Throughout This Guide. In other words, you'll be critiquing his or her site. #5. The Word "Harsh" Doesn't Mean A Thing. ** I would recommend that you move the definitions of critical and in-depth to below the sentence What it should be is critical and in-depth, both of which features of a high-quality review. I believe it will be more effective because you will be "feeding" your reader fewer definitions at a time. As well, the references you make to the definition of "harsh" in the paragraph beneath the definitions will be more clear with only one definition preceding it. #6. The Word "Harsh" Doesn't Mean A Thing. They want to convey the idea that their reviews take even the smallest detail into account. #7. How To Describe Quality. …so that you're not bashing or hurting the site owner's feelings when you're describing his or her site. #8. How To Describe Quality. …because you're letting the site owner know that there are areas that need improvement. #10. How To Describe Quality. A review is a collection of your opinions and the site owner has asked you for them. #11. How To Describe Quality. …and is more likely to make the other side owner feel bad or less confident about his or her work. #15. Using An Assertive Tone. You're presenting an (delete the word "your") opinion without using a negative attitude. #16. Using An Assertive Tone. If the reviewer used "low-quality" instead of "ugly, this would have been an assertive statement, but because of the overly negative tone, it's an aggressive statement instead. #18. Using An Assertive Tone. ** A general comment about this section: I understand that it is difficult to explain the differences between the three types of statements! However, I found that I was a bit confused as I was reading. One part I was especially confused about was at the very end, where you categorized a passive-sounding statement as an assertive one. I think you should provide additional examples to further explain the differences! An interesting idea would be to include a link to a "quiz" at the end, where you provide 10 or more sentences and ask the reader to determine what kind of tone each sentence/phrase has. On a separate page, you can include the correct answers and a short explanation. Good to hear that you are adding a quiz factor to your site! #19. To Summarize. ** First bullet point: change their to his or her. #1. Building Your Rubrics. One of the first things a new reviewer should always think about are the rubrics that will be offered at his or her site. #3. Building Your Rubrics. Regardless if a score is given, rubrics give requesters clear indications of what reviewers will be critiquing. #6. Different Types Of Rubrics - Pro/Con. It's not meant to be all-encompassing like the "classic" review but instead, should be short and to the point - indicating what the site owner is doing right and what he or she needs to work on. #11. Different Types Of Rubrics - Rubrics Gaining Popularity. ** I recommend that you include a subheader for this section to separate it from the more common rubric types. #12. Different Types Of Rubrics - Custom. …as you can never predict what you'll be looking at until the visitor sends in his or her form. #13. Different Types Of Rubrics - Custom. ** I recommend that you put the "Rubric title: Custom…" portion into one of your text boxes with a light border to separate it from the rest of the normal content. #14. Caution: What Should Never Be In A Rubric? …there are always certain categories that (remove I inevitably find that) make me chuckle or worse, grimace. #15. Caution: What Should Never Be In A Rubric? ** I would have to disagree with your general statement about Updates in rubrics. One thing that irks me when I visit sites, especially request sites, is when they do not have an updates section at all. As a frequent visitor of sites, I usually check updates first in order to see if requests are open or being completed at a fair pace. This is usually a huge factor on my decision to request from the site or not. Because it is such a vital portion of certain site's functions, I think that you should refrain from writing that updates should never be included in a rubric. I agree that it is unfair to deduct points for a lack of updates/frequent updates in a review if the site does not need them. Certainly, as you mentioned, guides and resource sites do not need to update daily, nor do they even need to have updates. However, the frequency of updates is not the only criteria that can be used to assess updates. Clarity and conciseness are two other important aspects. Perhaps a section focusing on updates alone would not suffice - instead a category for updates/introduction for example would work, as some sites may solely be assessed on their introductions while others would be marked based on the two combined. To conclude, I suppose you could consider this a personal preference but I think that writing that updates should never be in a rubric in your reviewing guide is a bit misleading. #16. Be Careful About These Categories - Sitely ** I would also slightly disagree about your statement about having no listers. Though a site does not require listers, it is very beneficial for a site to be listed at a few directories. This is because in order for a site to be useful to the community, it must be visited by others. If a fantastic guide is written, its purpose will not be served if no one visits it. Directories can help to increase traffic to sites and distribute their content, which is why I believe that ensuring that a site is listed at at least the major directories is key to its success. I do, however, agree with your quantity point. #17. Be Careful About These Categories - Sitely. If someone had the link back buttons at the very bottom, the achievements at the top, and the credits on an "extras" page, that wouldn't be a very organized "sitely" page. #18. Be Careful About These Categories - Sitely. Keep in mind, the "sitely" page should contain things that involve the site, such as information about where it's been reviewed at, who its affiliates are, and its site counter or visitor tracker. #19. Be Careful About These Categories - Content Quantity. In my own review forms, I ask that requesters give me an indication of how long their sites have ben active just so I can measure the quantity on their sites versus their sites' ages. #21. Be Careful About These Categories - Content Quantity. Let's say an untaken name site has 100 names and it's been open for three months. #22. To Score Or Not To Score. At the very start of the review, he or she has 10 points. #23. To Score Or Not To Score - Pro/Con Table. ** I recommend that you add a few breaks (br) after the last bullet point for Letter grade to better align the bullets. Currently, the bullets for Letter Grade begin much lower than those for Numbers. The ones for Stars also seems a bit misaligned. #24. To Score Or Not To Score - Pro/Con Table. ** As well, it may be a good idea to bold and colour the positive (green) and negative (red) signs in the table, as currently it is a bit difficult to notice them. #27. An In-Depth Rubric Reflects… Is he or she looking at quantity? Quality? Will he or she be looking at how textures are applied? Text visibility? The site owner hasn't done enough to properly clarify his or her expectations or what his or her focus will be. #28. An In-Depth Rubric Reflects... (spelling errors have not been changed as the section has been copied directly from the site). #30. An In-Depth Rubric Reflects... …with a list of questions that he'll head into the review with. #31. An In-Depth Rubric Reflects... In one of its rubrics, The Lodge does an amazing job with this section. I believe that this altered order of phrases makes more sense to a reader because it introduces the "premade" questions and indicates where they are before their purposes are explained. #2. Questions For Each Site Type - Graphics. In terms of assessing graphics, look at what the site owner has done. Is his or her colouring technique eye-catching? Has he or she applied textures properly or has he or she not blended it into the base image? #3. Questions For Each Site Type - Request Sites. Because these are request sites, I always try to relate my critique back to the visitors and their requesting experiences. (** I've changed the object of the sentence to plural because in the previous sentence, you have already begun by addressing request sites.). #4. Questions For Each Site Type - Request Sites. Rules: The vast majority of request sites will have some form of "rules" on their pages. #5. Questions For Each Site Type - Request Sites. ... move through the site, and pick-up their custom items. #7. Questions For Each Site Type - Request Sites. Are they clear to understand? Are they too easy to catch? #8. Questions For Each Site Type - Request Sites. In their "pick up" areas, do they provide the codes in textareas? Do they write the names of the requesters above their respective request? #11. Questions For Each Site Type - Review Sites. Is the reviewer fully explaining his or her opinion? #12. Questions For Each Site Type - Review Sites. Is the site owner putting his or her reviews into a tiny div box? #13. Questions For Each Site Type - Review Sites. Has the reviewer explained each category properly or is he or she leaving it almost blank? #15. Questions For Each Site Type - Button Request Sites. ... the text is the most important thing on a button. #16. Questions For Each Site Type - Button Request Sites. Did he or she explain why he or she doesn't make buttons for those types of sites? #17. Questions For Each Site Type - Button Request Sites. Perhaps for the second question, you can include something along the lines of "are the animations for the buttons slow enough for a person to read the text?" #18. Questions For Each Site Type - Button Request Sites. Has he or she remembered to include border=0 in the code? #22. Question For Each Site Type - Premade Layouts I'd suggest using screenshot instead of screenie in general, as it is more professional sounding than the latter slang. #23. Questions For Each Site Type - Layout Request Sites. ...and where the navigation is placed. #25. Questions For Each Site Type - Layout Request Sites. ...it's one of the first things he or she sees. #26. Questions For Each Site Type - Guides/Tutorials. Insert a comma between the phrases whether text-based or visual and can be interesting to review. #27. Questions For Each Site Type - Guides/Tutorials. ...has he or she included a fixed "back to the top" link? #28. Questions For Each Site Type - Guides/Tutorials. ..has he or she fully explained his or her reasoning? #29. Questions For Each Site Type - Guides/Tutorials. ...has he or she included screenshots to help guide the reader? #31. Questions For Each Site Type - Guides/Tutorials. If it's a more "visual guide" (like how to make buttons or banners), are there screenshots or visual examples included to aid the reader? Are there any areas where there aren't any visual aids? #32. Questions For Each Site Type - Link Directories. ** Remove the word also under the important category Convenience, as this is the first section you talk about so the word becomes redundant..
#33. Questions For Each Site Type - Link Directories. ** Some of your important categories are listed as questions. You may consider including these under the Questions header instead. #34. Questions For Each Site Type - Link Directories. Based on how old the site is, are there enough sites listed? #35. Questions For Each Site Type - Link Directories. Are the link categories clearly defined? Or are different categories lumped together like requests with general graphics? #36. Questions For Each Site Type - General Questions. Are the link back buttons high-quality? #37. Questions For Each Site Type - General Questions. Are appropriate header used to divide each category? #38. Questions For Each Site Type - General Questions. Has he or she listed where he or she got resources, images, or textures? #39. Questions For Each Site Type - General Questions. Has he or she used text styles appropriately? #40. Questions For Each Site Type - General Questions. Has the site owner introduced himself or herself and linked to his or her userlookup? #42. Questions For Each Site Type - General Questions. Is the site owner being overly wordy? #43. Questions For Each Site Type - General Questions. Organization can refer to where the site owner places his or her content, or how he or she has ordered the content on a specific page. #44. Questions For Each Site Type - General Questions. Is space being used effectively? #45. Questions For Each Site Type - General Questions. Is there any rhyme and reason to how content is separated? For example has he or she properly put banners and icons or separate pages or has he or she lumped everything together? Below is a sample of a review that Esteem has completed in the past. Does your site have the basics? - Your site scored 31/50 for the basics. Although your site has great content, it must also have the necessary mechanics for it to be truly successful. I am aware that Uniocto is an older site but it is essential to be up-to-date with your affiliates, listers, and also quality of link back buttons. Perform frequent link sweeps of your site! I ask you to also check your grammar through MS Word as you are writing text for your site, as there were many errors in the current blurbs. Keep on working at it - I'm sure you'll succeed! - Your introduction is simple yet effective. You included the necessary link to your userlookup, as well as a link for the visitor if he or she wishes to neomail you. As well, you have included a general summary of your site's content. - I recommend that you include your username in brackets next to the link to your userlookup, as it will allow visitors to become familiar with it. - There are several grammatical errors within your introduction. For one, some sentences are fragments and are not complete. This will be further addressed and fixed under Spelling and Grammar. However, because these errors do greatly affect the introduction, marks will be deducted from this section as well. 2 points deducted for grammatical errors (-2). - You have a decent amount of link back buttons for your site's age. However, many of them are not of the best quality. This includes the 1st, 3rd, and 4th buttons in the first row, and the 1st and 2nd in the second row. I recommend that you request for more buttons. Check The Status Centre for recommended sites with open buttons requests! People are far more likely to click high quality link buttons than those that are low quality. You will want to make a good impression to the community even when they are not visiting your site. I'll critique each one and point out their flaws below. - First row, first and third buttons: Their animations are choppy, as in they do not flow very well. The images have not been enhanced and edited in a way that catches a viewer's attention. Particularly in the third button, the animation touches the white part of the border - disrupting the space element of the button. - First row, fourth button: The colour scheme of this button is fairly dull. Although neutral colour schemes do work for some buttons, this is usually when the background or image used is dark and the text is light. However, the exact opposite is present in this button. As well, the font is slightly difficult to read. - Second row, first and second buttons: These two buttons are quite similar, in terms of image cropping and even font face! I recommend that if you do decide to keep some of your lower quality buttons, that you at least remove one of these buttons - preferably the second. The similarities of the two make them redundant. The font face is also quite difficult to read in both. 2.5 points deducted for low quality link back buttons (-2.5). - The organization at Uniocto is decent. The SOTM page is organized well; the spacing of the sites' buttons and votes is excellent. The Rankings page is also well organized; the headers separate and define each category well. I have just a few suggestions for certain areas of the site. - Because Uniocto's SOTM odes not have very many rules, I recommend not putting them within a div box. The scroll bar makes them difficult to read, and you definitely want your visitors and participants to be reading your rules. - The blurb under My Pick should be aligned to the left, as this will make it easier to read. - You have past layouts listed twice, under Achievements & Past Layouts. - Include the header for Achievements & Past Layouts on the respective page. This will help visitors remember which page that they are on. - Back buttons are required in the sitely section and extras section. It is quite inconvenient to navigate through a site if back buttons are not present. - The awards in the Remembranced section should be centered. The voting sign under SOTM should also be centered. 2.5 points deducted for lack of back buttons (-1), issues with rules (-0.5), items listed twice (-0.5), and alignment issues (-0.5). - You are listed at a great amount of directories for your site's age. However, I'd like to point out that Meepits Are Love, Dark As Day, The Corner, Fleur, The Croaker and Cubicle have closed. This reduces the amount of listers that you have to six, which is still acceptable. However, these inactive links should be deleted. Remember to do weekly link sweeps to ensure that your site is dead-link-free. - The links at Angel's Directory to the SOTM section do not seem to be working. This means that your site is not actually listed at this directory. 2 points deducted for many dead links. - You have a decent amount of affiliates for your site's age. - I recommend that you include a form for potential affiliates to apply with. This is more convenient for appliers and will let them know what to include in their applications. - I suggest that instead of writing "affies" in your header, write the full word "affiliates" instead. Using full words instead of acronyms or short-forms is much more professional. - You also have several inactive or closed affiliates. These will be listed under Link Sweep. Note: Items with a - next to them affect your score, while items with * next to them do not affect your score. - The first two sentences should be connected by a comma. It should read as "Welcome to Uniocto, a contest site that is run by the talented and crazy Joaquin (trophy99)! - The third sentence should be "This site allows people to enjoy competitions and participate in Uniocto's Island Getaway!". - The fourth sentence should be "The Pirates are currently taking a break from their underwater dive. - The fifth and sixth sentences should be connected. They should read as "This site has everything you need: SOTM contests, rankings, and more." * The last sentence should be "Feel free to send me a neomail with comments!" * The rules are currently written rather casually. I recommend changing them to the following: 1) You must vote for three sites, no more or less. 2) You cannot vote for your own site. 3) You may ask people to vote for your site. However, please do not force them to or go overboard with it. - "Voting ends in April 30!" should beVoting ends on April 30th! - Under My Pick, the words "ever" and "directories" should be switched. - Under My Pick, "the faerie compass" should be have capitals for their first letters. - In the participant award, "@" should be replaced with "in". - The blurb under Remembranced should be "Do you remember all the old sites that have closed? Here, you can read about their stories and deepest secrets. - The link to Achievements & Past Layouts should not have two & signs. - The blurb under Achievements & Past Layouts should be "Here you can view all the achievements that Uniocto has gained, as well as the past layouts that helped the site to be what it is now." - The second sentence should be written to be "This is where great closed sites are remembered. - The third sentence should be "We will get to hear an inside story from the closed site's owners. - The green text should read "This section will be updated whenever a worthy site is closed. - Under Why?, it should read "So NAME, why did you close SITE NAME and is there one secret about the site that no one knows?" * I'm not sure that you need the blurbs beneath each section in Sitely, as each link is rather self-explanatory. - Under Link Back Buttons, the blurb should be "Here you can find link back buttons that can be used to link back to the site. - Under Relatives, it should read "Here you can find links to my relative sites, who are also running SOTM sites. - Affies should read Affiliates. - Under Affies, the blurb should be "Here you can find other great sites that are worth visiting! - Under Listers, it should read "Here you can find where Uniocto is listed! - Under Reviews, it should read "Here you can find the reviews of Uniocto, links to these review sites, and the score that my site received. - Under Credits, the blurb should be "Uniocto would not be here without the help of these listed people and sites." - The blurb should read "Inactive affiliates will be removed without notice. However, if your site is on a hiatus, (explain what will happen)." - The header should read "credits", not "credit". - The first credit should read "Coding and layout all credited to LIly at The Gazebo. - "Button here's" should be "Button here resources". * I'm not sure what mascot you are referring to in your credits. - The colours chosen for headers, body text, and text decoration are dark enough to read. As well, the line spacing of your text is excellent. - Your body text is quite small. For screens with large resolutions, it may be difficult to read your content. I suggest increasing its size to around 9pt. 2 points deducted for small body text. - Credits: Beautiful Rescue and Paper Doll are closed. - Rankings: Fontosis is closed. - Rankings: Teams and Predictions; Altador Cup is closed/broken. - Affiliates: Amore, Vertigo, and Vogue are inactive. Does your site have potential? - Your site scored a 40/50 in terms of its potential. Joaquin, it is clear that Uniocto is an excellent SOTM site that is capable of attracting participants and voters alike. I made a few comments and suggestions below, the most important regarding the revisit factor. Because your site is already quite excellent in terms of potential, I recommend that you take it to the next step and invest in a few more original ideas. Keep up the great work, Joaquin! - Your competition site hosts a fairly simple and straightforward SOTM contest. By looking at your most recent competition stats, you are quite capable of attracting votes and participants alike; bravo! I would recommend that the winners are listed in a bolder font face, to emphasize that the competition is over and the winners have been deduced. - Though your SOTM contest is straightforward, it does not possess a revisit factor; there is a lack of reason for a visitor to revisit the site after voting in the competition. I recommend that you strive to add a creative aspect to your site to garner more views and participation. Some competitions sites such as The Scrapbook (now closed) have allowed visitors to vote everyday - a tactic that definitely holds a revisit factor. Other sites have held Button Of The Month or Graphic Of The Month contests that have attracted visitors with different strengths. Perhaps you can even host a unique "extra" that is useful and changes often! It is truly up to you as to what should be added to your site to score more revisits. - In terms of visitor convenience and service, Uniocto is off to a great start. The SOTM page is quite clean and organized, and it is easy to see which votes belong to which sites. One thing I would recommend is making your rules more specific. What exactly entails "going overboard with asking for votes"? Being specific will help your visitors and future participants. The rules, as mentioned under Spelling and Grammar are written quite colloquially. Also, because the rules are extremely short imperative phrases, you come across as slightly blunt. I would recommend revising them as suggested under Spelling and Grammar. As well, perhaps you should indicate what the title of the voting neomails should be. The title "SOTM Vote" or "Uniocto Vote" are both simple and realistic. 6 points deducted for no revisit factor (-3), lack of emphasis for winners (-1), and several service issues (-2). - Overall, your site's layout is quite interesting. Lily at The Gazebo has done a marvalous job with editing the images and organizing them in an interesting way. The asymmetry created by the shapes of the images on either side of the content box prove for an intriguing layout. - There are a few issues regarding spacing in terms of the layout. For one, the navigation appears to be much too small. This is a little inconvenient for visitors to navigate through your site. I recommend enlarging it several font sizes to make it easier on your visitors. Your layout is also spaced quite fat from the left edge of the screen. Although it may fit in your current screen's resolution, it may not for visitors with screens of lower resolution. I recommend shifting it to the left and up as well to give these visitors an easier time. - As well, your site's background does not fit well with the layout. This is because of the unfitting white background of the layout's main image. Because you did not create your layout, I recommend that you notify the layout creator and ask for them to change the background of your main image to transparent. 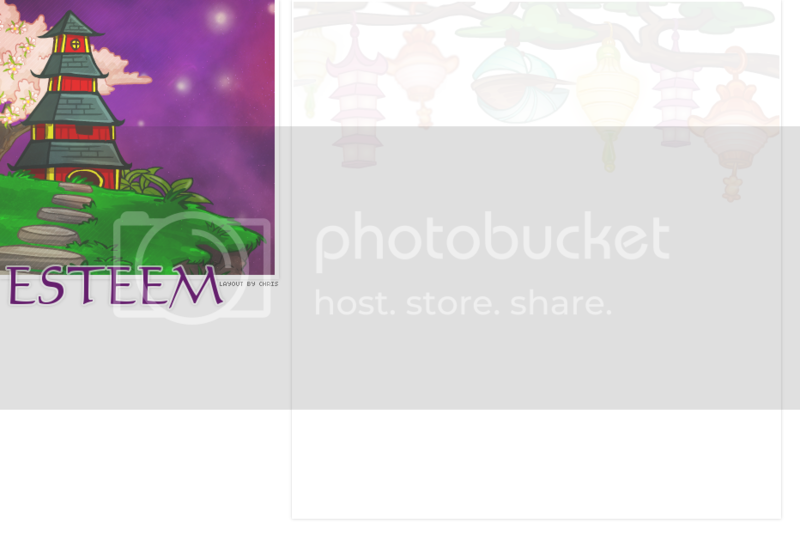 This will allow for the actual site's background to become more coherent with the rest of the layout. If the layout creator does not have the original file with the layers, I suggest that you change your background tiles to a mere block of white. It may be slightly boring, but it is better than the current situation. - I noticed that the main text box overlaps parts of the circle images on the right. When this section of the main text box contains text, it can be very difficult to read. Normally, I would suggest that you make your main content text box smaller to accommodate the intruding image; however, your main content box is already quite small. In this case, there is not much you can do besides request for a larger space for content in your next layout. However, this is not a very big issue so I wouldn't worry about it too much. - The headers present in your layout are slightly uninteresting. The white background bar of the header 1 does not quite fit your layout and clashes with the background gray colour. The colour of the font of this header also is dull and almost black! There are many beautiful and lush colours present in your layout and I highly recommend that you use these to your advantage. Bright colours will help to create unity in your layout, as well as attract a visitor's eyes. - On the main page, part of the SOTM section can be seen in Safari. Perhaps you should add a few break tags between each anchored page to fix this problem. If you would like a screenshot of this, do notify me. 4 points deducted for transparency and background issues (-1), coding and spacing issues (-2), and uninteresting headers (-1). Following this paragraph is a list and small description of both my strengths and weaknesses in terms of reviewing sites. These factors may affect the reviews that I write so I highly recommend that requesters read through this section prior to sending in a request form. I am currently majoring in Visual Arts as a part of the specialized Arts Program at my high school. As a result of my experience in the field, I am capable of thoroughly analyzing visual aspects of sites, including layout and any type of graphic. In preparation for writing my SATs, I took several classes that focused on improving grammar and noticing common grammatical errors. Thus, I will be able to effectively correct any grammatical errors found on sites. As well, I am an avid reader and thus am capable of rephrasing awkward sentence structures. As the host of the premade font site Mint Condition, I have the necessary experience to fairly assess fonts and any font-related sites. My knowledge of the functioning of applications, guilds, shops and galleries is limited. As a result of my lack of experience in these fields, Esteem does not offer reviews for these types of sites. Although I know basic coding, it is definitely not my strong point. Should you have any coding problems, I will try my best to help you and will most likely direct you to another site for further assistance. Because of other commitments, I review rather slowly. If you are desperately in need of suggestions and constructive criticism within a tight time frame, I would suggest that you request from a site with faster reviews. After reviewing a site, I will always either deem it to be recommended for the community or not recommended at all. All "esteemed" sites will be listed here and are organized alphabetically under their respective categories. If your site has been deemed an Esteemed Site, please feel free to take the button below! Looking to request a review from a review site? Then this mini-guide is just for you! This page is currently under construction. To apply, send me a completed version of the form below! ** Keep in mind that Esteem is looking to be affiliated with high quality sites, preferably those that offer reviews. A big warm thank you to all those who have recognized Esteem in some way, shape, or form! Hover over the buttons for more information. All content and ideas were created by me, Evan (aloveletter), unless stated otherwise below. • Many thanks to Chris for making this stunning layout! • All link back buttons are linked to their respective creators. • Credentials idea credited to Rika from the Review Site Awareness event. If you found this page, you're not supposed to! Please refrain from reading the below review, as it is currently under construction. This page is used to test out the formatting of reviews before they are posted in Esteem.